Original caption: Young Filipinos in holiday attire. Image source: United States National Archives. 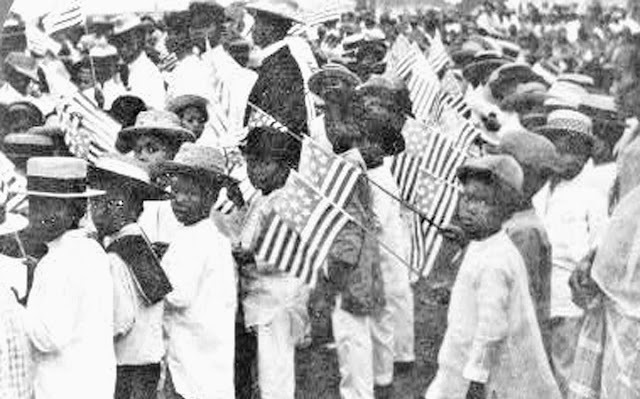 In 1903, the new American colonial government in the Philippines passed the “Pensionado” Act which aimed to “educate and bind current and future Filipino leaders to the American colonial administration1.” The name was something of a misnomer because, essentially, the act called for the education of Filipino students in the United States to acquire not just western knowledge but also to learn about the culture of the country. The program called for by the act was discontinued in 1914, but then revived afterwards by the Bureau of Insular Affairs2 and later by the Philippine Commonwealth Government3. From a 1917 publication of the bureau4, we get a sampling of students, particularly those from Batangas, who applied for and were given grants to study in the United States. The publication gives the date of 1922. However, the Library of Congress (United States), which has archived the directory, has placed the date of publication at 1917. In total, there were 1,156 Filipino students in the United States at the time of the directory’s publication. Of these, 42 were from Batangas. Bauan had the most number with fourteen, followed by Taal with seven. The towns of Batangas, Lipa, San Jose and Santo Tomas each had three. Lemery and Calaca had two each while the rest, Balayan, Cuenca, Ibaan, Lian and Talisay each had one. Montenegro, Pio N. Notre Dame University, Notre Dame, Indiana. Ph. B. in Journalism. Arguelles, Francisco L. University of Illinois, Urbana Illinois. Commerce and Banking. Claudio, Eduardo L. Columbia University, New York City. Business. Velasquez, Virgilio. Georgetown University, Washington D. C. Foreign Service. Buendia, Juan C. University of Idaho, Moscow, Idaho. Medicine. Conti, Melquides. Broadway High School, Seattle, Washington. College Preparatory. Cordero, Leopold M. Lincoln High School, Seattle, Washington. College Preparatory. Cordero, Rosario M. University of Washington. Pharmacy. Generoso, Maximo F. Polytechnic College of Engineering. Engineering Mechanic. Halili, Leandro C. University of Southern California, Los Angeles, California. Political Science. Hernandez, Salustiano C. University of Washington, Seattle, Washington. Banking and Finance. Maliuanag, P. G. Polytechnic College of Engineering, Oakland, California. Civil Engineering. Mandanas, Francisco Y. University of Washington, Seattle, Washington. Science. Medrano M. R. Northeastern College, Brookline, Massachusetts. Auto Mechanic. Panopio, Felix M. Heald's Engineering School, San Francisco, California. Electrical Engineering. Sulit, Silvestre. Broadway High School. Seattle, Washington. Talag, Baldomero B. Broadway High School, Seattle, Washington. College Preparatory. Ylagan, Alfonso O. National Salesman Training Association, Boston Massachusetts. Salesmanship. Bautista, Enrico M. St. Martin's College, Lacey, Washington. Premedical. Marasigan, Rafael A. Lewis Institute, Chicago, Illinois. Medicine. Jaen, Juan L. George Washington University, Washington D. C. Political Science. Reyes, Benito. Oregon Institute of Technology, Portland, Oregon. Auto Engineering. Dimaandal, Jose I. University of Chicago, Chicago, Illinois. Commerce and Administration. Magsino, Vicencio K. Hahnemann Medical College, Chicago, Illinois. Medicine. Katigbak, Pablo S. University of Chicago, Chicago, Illinois. Political Science. Nazareth, Baldomero. National School, Washington D.C. Law. Silva, Pablo M. George Washington University, Washington D. C. Law. Limjoco, Conrado T. University of Nebraska, Lincoln, Nebraska. Medicine. Aguila, Jose C. University of Washington, Seattle, Washington. Foreign Trade. Laraya, Sixto. University of Montana, Missouri, Montana. Forestry. Lardizabal, Gregorio. Teachers' College, New York City. Normal Instruction. Fidel, J. L. New York University, New York City. Business Administration. Manzanero, Dr. F. M. Baylor College of Medicine, Detroit, Michigan. Medicine. Milaor, Lazaro. University of Chicago, Chicago, Illinois. Educational Administration. Trinidad, Venancio. Iowa State Teachers College, Cedar Falls, Iowa. Education. Atienza, F. C. Bodee Dental School, Brooklyn, New York. Mechanical Dentistry. Castro, Ignacio M. St. Mary's College, Oakland, California. Law. Gaa, Jose M. College of Business Administration, Seattle, Washington. Business Finance. Manalo, Ramon. University of Pittsburgh, Pittsburgh, Pennsylvania. Economics. Manalo, Ramon A. Duqueosne University, Pittsburgh, Pennsylvania. Commerce and Finance. Orosa, Jose Y. University of Washington. Foreign Trade. Salazar, Felino. University Y.M.C.A. Seattle, Washington. 1 “Education in the Philippines during American rule,” Wikipedia. 2 The Bureau of Insular Affairs was a branch of the United States Government which oversaw the “civil aspects of the administration of several (American) territories from 1898 to 1939. Wikipedia. 3 “The Pensionado Story,” by Mario E. Orosa, online at the Orosa Family Web Site. 4 “Directory of Filipino Students in the United States,” published by the Bureau of Insular Affairs, War Department on 1 January 1922.